MozBackup for Windows XP - a functional utility for working with user settings of a browser or email client. The application contains a wizard for step-by-step archiving of data, allows you to create backup copies of temporary files, history, settings, list of bookmarks, billing information, passwords, letters and attachments. The program supports the bak extension, allows you to create copies at specified intervals, contains a version manager and tools for quick recovery of parameters. The utility has a minimalistic interface that can create a complete copy of all Mozila browser data. 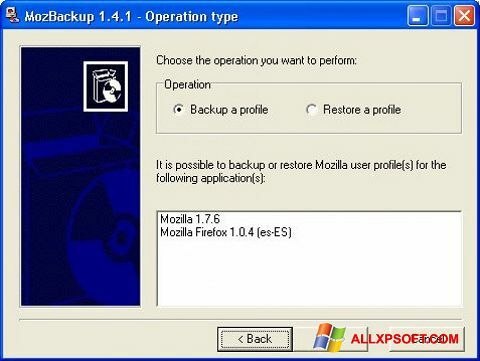 You can free download MozBackup official latest version for Windows XP in English.